Ona's house offers you an escape to a peaceful place in an uptight world. Affordable vacation rental in Wallace, Idaho. This is a fun place to stay with lots to do. Please remember that Wallace is known far and wide as a friendly walking town with nicely paved streets and alleyways and wide sidewalks with beautiful boulevards. Let's begin with a short walk to the city center where you will find popular restaurants, micro breweries, museums, and shopping (antique stores, second hand and local gift shops as well). 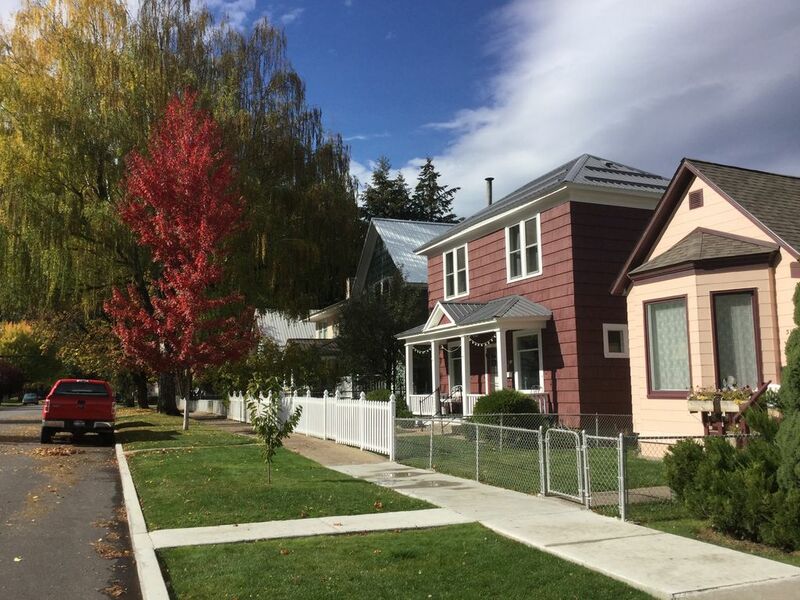 Depending on the season you can attend the Sixth Street Melodrama, the Sierra Silver Mine Tour, the Silver Streak Zip Line and even the Wallace swimming pool. Wallace is located between Missoula, MT. and Spokane, WA. An easy two hour drive in either direction will deliver you to an international airport of your choice. This little mining town has a rich history and is also known for it's classic architecture that put it on The National Register of Historical Places. Don't forget to find the "Center of the Universe " while visiting our community. Ona's house is on that National Register as it was constructed in the mid 1890's as a miners home. The residence was remodeled in 2015 for a single homeowner who passed away in the spring of 2016. Since that time additional work has been done on this property so others can come to Wallace and enjoy the town and it's safe and peaceful community. The living room features a classic bay window which was considered very stylish for it's time. The master bed room has a queen bed and the back bedroom has a queen bed as well and a twin rollaway. There is one bathroom with a shower and a fully equipped kitchen and a washer and dryer too. This home would be great for single people, couples, families or friends. The sofa in the living room is a queen hide a bed as well. Cable TV and wifi are standard. Outdoor activities from Wallace include two ski areas just minutes away, snowshoeing, hiking trails including the Pulaski Trail and the 80 mile long Trail of the Coeur d' Alene bike trail. If you love biking don't forget to try the Hiawatha trail that is just a short drive from Wallace on I-90. Hunting and fishing are available for those who are interested in such. Be sure to come to Wallace and give it a try. Elmer and Corki have lived in Wallace for the past thirty years. They are long time Silver Valley Residents and Elmer was born in the old Wallace Hospital. Both are retired and stay involved in their community. Corki owns her own printing business appropriately named “Corki’s Ink”. Elmer’s mother purchased this property in 2015 because of it’s close proximity to their home, just two houses away. The remodel effort was substantial and following the passing of Elmer’s mother it was decided to keep this historic property and turn it into a vacation rental so others can come and enjoy our unique town. In January 2017 this rental became Ona’s House rented through VRBO and is so named after Elmer’s mother. This charming cottage speaks to every one who stays there. The home is located in a beautiful quiet neighborhood that is in close walking distance to the historic downtown. Most of the photos and paintings in the home reflect the beauty and history of our community. Wallace is surrounded by the Bitterroot range of the Rocky Mountains. Five mountain streams come together in Wallace and the area was known to be a cedar swamp when first occupied in the late 1800’s. WIFI is part of the package and available as soon as you enter the home and type in the password. A new dishwasher was installed in February 2017. A new oven was installed in February 2017. Keurig provided, please furnish your own coffee. A few K cups will be provided. Also there is a Mr. Coffee for regular brewing and some coffee provided for its use. Flour, sugar, salt, and pepper provided. A new sink and countertops installed in February 2017. An assortment of books is provided. Small lawn in front with table and chairs in back yard. Possible to pitch tent or park small camper in back yard. two adult bicycles provided for a small fee. The back porch allows for out of the way storage for luggage, skiis, backpacks, etc.. A garage in the backyard is ideal for storage of larger items such as bicycles Kayak’s, etc. We had a spring break getaway. We love skiing and snowboarding in Idaho. We met the owner, Elmer and learned more about Ona's house. This house is perfect. It can sleep 7 if needed. Only one bathroom, but with good logistics, you can make it work. Close to downtown Wallace. We recommend 1313 and Blackboard cafe. Cute, clean, comfy beds, great location. Great place to stay in Wallace! So happy that you spent your time in Wallace at our vacation rental. There are lots of choices in the silver valley so thanks much for selecting ours. We hope your kids did well in their ski races and we see you again on another trip here. We had a great stay at Elmer’s home. Very cute, clean, tidy, and our experience was wonderful! Thanks so much for staying at our vacation rental. It seems like our guests are always top notch and we appreciate you selecting our property for your stay. Thanks again. This is a great place in Walla. Clean and comfortable, walking distance to everything. A perfect ski getaway! Thanks Erik. We hope you had some great skiing and glad that you enjoyed walking about our little resort town. Have a wonderful 2019. Wonderful home and owners- great stay! Perfect for families- cute community and beautiful home. Thanks again for staying in Wallace and picking our vacation rental to enjoy Wallace from. You have a great family that I enjoyed visiting with. We hope to see you again some day. Take exit 61 on I-90 which is on the west end of Wallace. Turn south to the frontage road at the gas station. Turn left going east and follow the road into Wallace passing the Wallace Inn, Wallace high school and the public library all on your right. Here the road turns around the library going south and you will see the Red Light Garage on your right. This is Pine Street and you will turn right going west at this time. The Stardust hotel will be on your left and one block ahead on your right is your destination of 319 pine street, the second house from the corner. You have arrived at Ona's house and your parking will be on the street in front of this house. Prior to your arrival the code to the key pad entry will be texted or emailed to you.